I should have loaded these photos on to this blog on Thursday but they are of the old style buildings around the main streets of Gulgong - it is a very old town based on the Gold Rush etc. and the town itself has quite a few heritage buildings so they do alot of restoring - even houses near the town center are heritage listed and although they look really nice I am sure they are very expensive to buy and run! and the also serve $10 meals! the main street - as you can see it is very difficult to get 2 passing cars with a car parked either side of the road! and this house was next to one of the churches so I presume that it was the ministers residence. 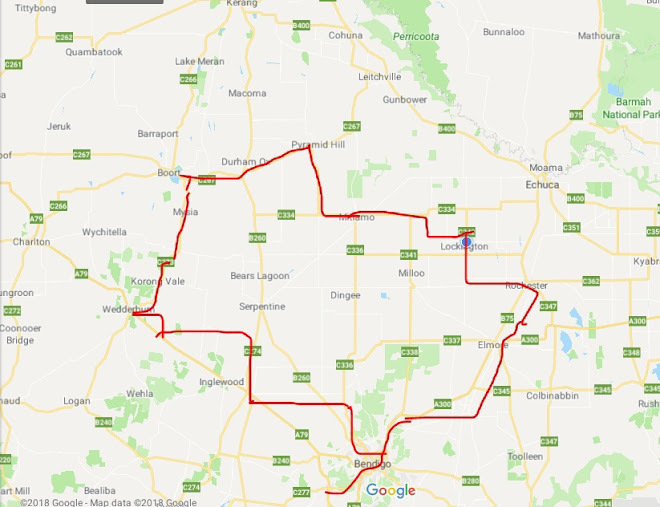 Anyway onto cycling from Gulgong to Wellington - we had a late start in the morning as there was another cyclist staying in one of the cabins and although he was just riding unloaded and his wife was following in the car and I think he had come from Sydney he just wouldn't stop talking! I think he was interested in what we were doing and might even consider loaded touring but at the moment he was satisfied with just riding his light racing bike! So we left around 8.30am and it was a cloudy overcast day but it didn't look like rain. 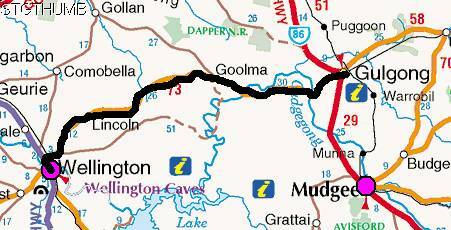 We took the road that goes to Mudgee and then at about 6km out we turned west onto the Goolma road. The traffic was relatively heavy but courteous to us. What made it even tougher was the road was extremely bad in places and so we had no other choice but to ride out in the middle of the road - it probably is the worse road we have taken so far. But watching the traffic even they were struggling with the road conditions - for us we can go around pot holes whereas they have to go in them! The road itself is windy in spots and you seem to be gradually climbing alot! There was not much downhill and only in a few places was the road flat. At Goolma which is 30km along there is a road that turns off to Dubbo and most of the traffic seemed to turn off there but I think since it is a long weekend here alot of the traffic was going to places (we can't figure out where everyone is going!) and at times with the windy road the overtaking traffic had to sometimes sit behind us until it was clear to overtake us! A few took risks and squeezed past us and even Neil got a stern beep as a 'patient transport' vehicle was going to squeeze past Neil and overtake while 2 cars were coming in the opposite direction but the road was so bad that Neil was sticking out a bit too far for the womans liking so she gave him a stern beep! what the moroon (spelling?) doesn't seem to realise is that the onus is on her - she can only overtake us if the other side of the road is clear for her - not beep and expect us to get off the road for her! There was one incident where a 4WD overtook Neil and then decided to over take me while a B double truck was coming the opposite way - he only just made it! Why do people take the risk? But most of the time the traffic was good to us. We had a cuppa at 40km and after that we were still climbing but once we crossed over into the Wellington Shire region the road conditions became marginally better. At around the 50km mark we saw the communications towers which means we must be near the highest point in the ranges and sure enough from there it was predominantly downhill to Wellington but the good thing about the downhills was that it was relatively gradual and since the road surface wasn't so rough you could cruise down at around 30km per hour and not have to manouevre the bike around the rough bits and pot holes! Along the way to Wellington we decided to stay at Wellington for another rest day and tackle the highway on Sunday when there is less traffic about. We thought there might be alot of people taking advantage of the long weekend and travelling around - on Sunday there should be less traffic and also the next 2 towns are small and the supermarkets are likely to be closed by the time we get there so we will have to carry alot of food - if we stay at Wellington then we only have to carry 2 days worth of food for Sunday and Monday!